Chia seeds are tiny seeds which are packed with essential fatty acids, protein, fiber and many health-protective antioxidants. In fact, weight for weight, these super-seeds provide twice the protein of any other seed or grain, five times the calcium of milk, and an inexpensive, safe and high quality source of omega-3 fatty acids. Omega-3 is one of the "essential fatty acids" we need in our diets. It is essential because our bodies cannot manufacture it - it has to be obtained from our diet. Fish is a great dietary source of omega-3, but sea life has been exposed to many toxins. Flax seeds or flax seed oil is a good inexpensive, safe source of omega-3, but chia seeds are more convenient and even higher in omega-3, and are also more easily digestible when whole, than flax seeds. Chia seeds, in the same way as flax seeds, react when mixed with water to form a kind of glutinous solution, like a gel. They act in the same way in the gut, which is another reason why they are good for you. They benefit the digestive system by providing both a high amount of fiber, and also this action of forming a gel like solution moves through the body and cleans up as it goes. It's also thought that this gel physically prevents the fast breaking down of carbohydrates in the body, by slowing down the action of the enzymes on the carbohydrates. Chia seeds contain 19 amino acids, with all of the essential amino acids except taurine. They also contain more iron than spinach, more calcium than milk and even more antioxidants than blueberries, weight for weight. Chia seeds can be ground up and added to just about anything, like water, fresh juices, smoothies. They can also be sprouted in the same way as alfalfa seeds and used in salads. 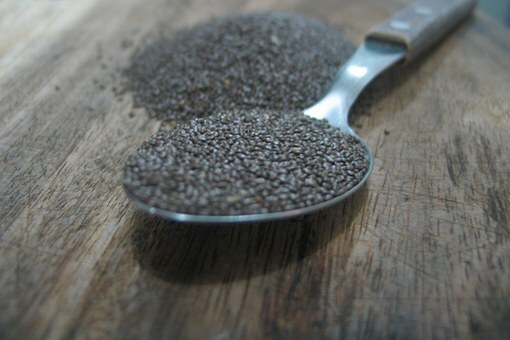 But unlike flax seeds, chia seeds don't have to be ground for consumption - they can be chewed whole. And unlike ground flax seeds, chia seeds don't deteriorate rapidly. Because they absorb water so much, chia seeds will help you feel full longer. Even eating the seeds or drinking them with a beverage will form a gel in the stomach which is up to 90% fiber. This is useful as an overall digestive and elimination aid. Chia seeds are available from health food stores and the seeds last a long time, so they can be bought and stored in quality.